This week’s The Tablet http://www.thetablet.co.uk/blogs/373/17 contains an interesting discussion on the possible discovery of Richard III’s bones under a car park in Leicestershire and their subsequent reinterring. One would have thought that finding and authenticating the bones would be the end of things. But No! The Tablet highlights the arguments as to where to re-inter the bones. In Westminster Abbey (because he was a king), in Westminster Cathedral because he was Catholic (the national religion at the time), Leicester Cathedral because the current location of the bones is within its diocesan boundaries or a Franciscan friary in Nottingham because that is the nearest to the excavation. Meanwhile the country is still split three ways as to the appropriateness of Richard’s reputation. Some think that it is well deserved. Others feel that he was traduced by supporters of the Tudor usurpers (i.e. Shakespeare) and other (of course) are not bothered either way. During Richard’s reign, the historian John Rous praised him as a “good lord” who punished “oppressors of the commons”. 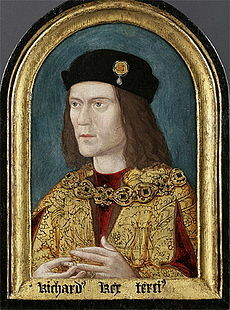 After his death, Richard’s image was blackened by his Tudor successors, culminating in the famous portrayal of him in Shakespeare’s play Richard III as a physically deformed Machiavellian villain who cheerfully commits numerous murders in order to claw his way to power. I’m beginning to understand why I once was a member of the Richard III Society.